It is supposed that the town was named after early settlers who arrived sometime before 1900. The community had some commercial buildings during the Great Depression, but it's close proximity to Paris made further growth unlikely. After WWII, increased mobility allowed people to find work in distant places and by the 1960s, there were no businesses left. 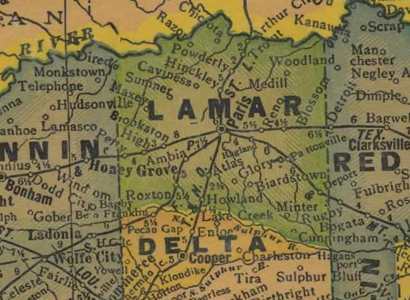 Now known as a "dispersed rural community," Taylor Town, along with it's near neighbor of Glory, Texas, have become ghost towns. I'm from Paris, Texas. Well I was born there, but my formative years were spent on the outskirts of Paris in Taylor Town. Down the street was Glory, Texas. My family had an old general store in Taylor Town called Gordon Mart (now closed)... now all that is left is a cemetery where a few of my relatives are buried. Glory is less than a mile from the Taylor Town area and I think all that is left there are houses and a church my grandfather attends.